Notification No.S.O. 1067(E) dated 14th May 2012 by the Central Government of India. Koushal, I believe, means Compassion, compassion for all living beings. The Indian Government made this move, basically to safeguard and secure its own Security. Nevertheless, Sri Lanka too benifits to a certain extent Security-wise. I do hope that you know. that it was INDIA that conceived this evil monster, and gave birth to it by a Caesarian Operation, in the hope of creating mayhem and untold destruction of Human Life, and the Economic Destruction of your loving neighbour, SRI LANKA. 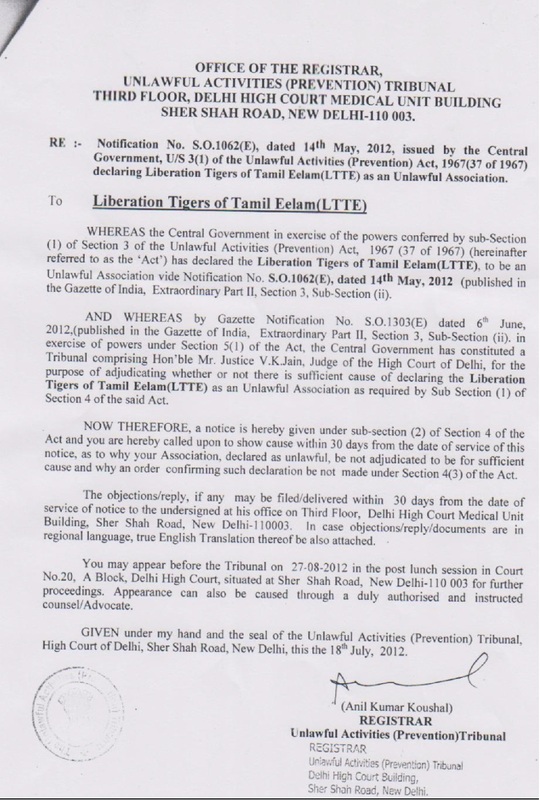 EXTENDING…LTTE… as an Unlawful Association is not enough by INDIA. You have three incorrigible step children, who are displaying INSANE FURY towards Sri Lanka, harping on the same concept of the LTTE IDEALOGY. You know who EH ??? The aging BALDY in New Delhi, whose vital organs are in a state of dysfunction, and continue to Dream of taking more and more Tamils towards Nandikadal, which is a Hoodo Area for Tamils. The other is your Victori a La Lita, always spewing hatred towards Sri Lanka, possibly in a state of Debility. Your Honourable Swamy, requested her to take a vacation in Sri Lanka, just a few days back. It will be like entering Shangrilla for her to re-juvanate. Yet another sycophant of Baldy Fame, WHY KO who always talks Stercus Tauri, about PEE LAM in Sri Lanka. Just do us one more favour KAUSHAL, THE COMPASSIONATE ONE !! Please tell the HONOURABLE SIKH SINGHEE, to tell the whole world that India brought forth this Monster LTTE out of WED-LOCK, and is now breeding a Progeny known to the world as TAMIL DIE-AS-PARIAHS, collecting FUNDS for the LTTE, which we INDIANS have banned again, on this auspiciou day of 18th July 2012. He can also make an appeal to the world to DEPORT all fund collectors to Sri Lanka, for a new life in the Slammer. May the Noble Triple Gem Bless You.